In the waning days of Saleh's regime, unconfirmed reports claim that military leaders purposefully withdrew their forces in order to destabilize the region. Within weeks, the governorate of Abyan fell under the control of Ansar Al Shari'ah (Al-Qaeda affiliated group). Their control over Abyan lasted from March 2011 to June 2012. During this time, it was declared an "Islamic Empire". After Ansar Al Shari'a were forced out, on June 19, 2012, U.S. officials including the US ambassador, Gerald Feierstein, and USAID administrator, Rajiv Shah, visited the war ravaged areas of Abyan. In September, they released this assessment. In this trip, USAID pledged to provide an extra 52$ million dollars of assistance to Yemen. Some humanitarian assistance began in Abyan; however, no concrete reforms can be felt. Before Ansar Al Shair'ah, Abyan had high unemployment rates, poor educational opportunities and was economically deprived. Government presence there was almost nonexistent. Now, not much has changed. Since 2012, there are tribal popular committees that were instrumental in evicting Ansar Al Shariah from the region much like Al-Sahwah tribal committees in the Anbar province in Iraq who helped end the war in Iraq. Government presence is still weak. The return of Ansar Al-Shariah is still a possibility as they are hiding in the neighboring regions. Ironically, some claim that a few members of the tribal popular committees are in fact members of Ansar Al Shariah. The question that comes to mind is why Abyan? and what to do? Abyan is a vast lawless area with a harsh terrain that lacks government authority and institutions. Low levels of education made the area ripe for extremist infiltration. Prior to the unification of Yemen, and in the context of the cold war, Saudi Arabia and the US supported Islamic extremists (Mujahidins) to combat the spread of communism in Afghanistan and in the South of Yemen. When Osama Bin Laden visited Yemen in 1989 (his only vist there), he brought Jihadis from Afghanistan to Southern Yemen. Also, Yemen was one of the few countries they could go. In the brief Civil War of 1994, former president Saleh used these returning warriors to help him win the war against those who declared secession. It was part of Saleh's strategy to spread the Jihadi, Salafi and Muslim Brotherhood movement in the South. 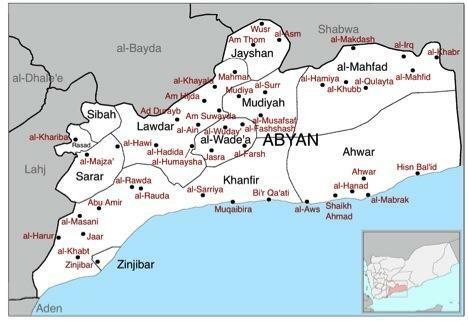 Historically, Abyan is known for adopting radical thoughts (for example; the Qarmatian movement (which is a Shi'i Ismaili group lead by Ali ben Fadhl Al Qormoti started in Jabal Khanfar in Ji'ar, Abyan. Also, Sufi extremist groups flourished there). Furthermore, in the past 20 years, most political and ideological movements in Abyan failed miserably So, the community felt that the "return to religion" is the only option to combat the problems facing them. The Jihadi/Salafi ideology is one that revolves around the concept of life after death, where things could be better. "An army of twelve-thousand will come out of Aden-Abyan. They will give victory to Allah and His messenger; they are the best between myself and them". The Aden-Abyan army wants to reinstate Islam as it was during the times of the Prophet Muhammed (PBUH). However, as we saw in their seize of Abyan, they were authoritarian and demanded absolute obedience. AQAP has become a rallying cry to many, but not out of conviction. Many people are not fond of Al-Qaeda, but like the saying "the enemy of my enemy is my friend"; because AQAP stands up to the government that neglected them, they follow suit. Currently, conditions in Yemen are substandard, and almost each region needs its own transitional plan. People in Abbyan need special attention (like other governorates) in order to revive their economy. Unfortunately, without any felt improvements, fighting jihad in order to go to heaven seems like a feasible venting method. Right now, people in Abyan are distressed and life is gruesome. The goal in Abyan is to lower the distress of these human beings. So what is needed is good governance and economic assistance in order for us to observe any real transformation in the region.